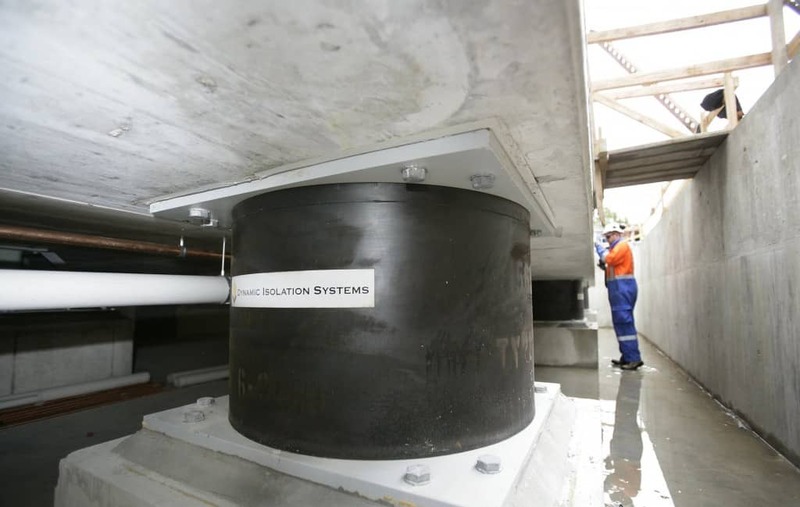 Base isolation is a state-of-the-art method in which the structure (superstructure) is separated from the base (foundation or substructure) by introducing a suspension system between the base and the main structure. 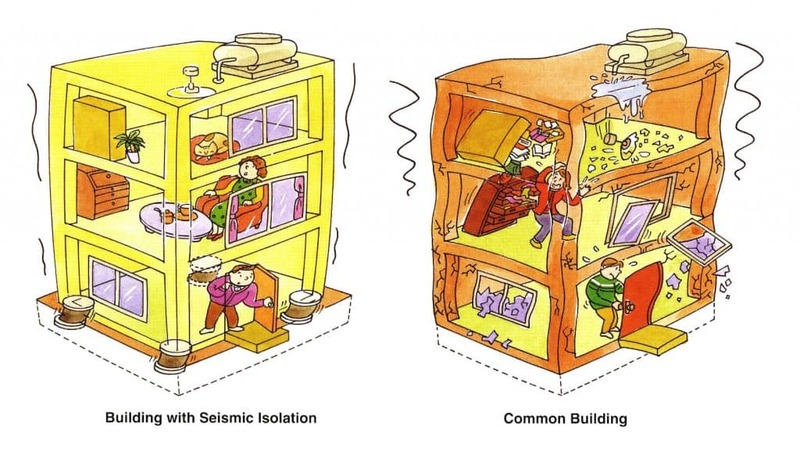 In context of seismic design of structures, base isolation can be replaced with seismic isolation i.e., the structure above the ground, which is most affected during earthquake is separated from the effects of earthquake forces by introducing a mechanism that will help the structure to hover. The concept of base isolation is quite easy to grasp. It can be explained as a bird flying during an earthquake is not affected. In simple words if structure is floating on its base, the movement of ground will have no effect on the structure. Wind and Earthquake are the most predominant loads that demands lateral design of a structure. Again, earthquake load is not controllable and it is not practical to design a structure for an indefinite seismic demand. Only practical approach left is to accept a demand and make sure the capacity is more than the demand. The inertial forces caused due to earthquake is directly proportional to the mass of structure and the ground acceleration. Increasing ductility of the building or increasing the elastic strength of the structure is the most conventional method of handling seismic demand. Engineer has to increase the capacity exceed the demand. Base isolation takes an opposite approach, i.e. to reduce the seismic demand instead of increasing the capacity. Controlling ground motion is impossible, but we can modify the demand on structure by preventing/reducing the motions being transferred to the structure from foundations. 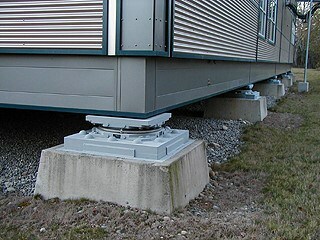 The basic principle behind base isolation is that the response of the structure or a building is modified such that the ground below is capable of moving without transmitting minimal or no motion to the structure above. A complete separation is possible only in an ideal system. In a real world scenario, it is necessary to have a vertical support to transfer the vertical loads to the base. The relative displacement of ground and the structure is zero for a perfectly rigid, zero period structure, since the acceleration induced in the structure is same as that of ground motion. Whereas in an ideal flexible structure, there is no acceleration induced in the structure, thus relative displacement of the structure will be equal to the ground displacement. No Structure is perfectly rigid or flexible, therefore, the response of the structure will be between the two explained above. Maximum acceleration and displacements are a function of earthquake for periods between zero to infinity. During earthquakes there will be a range of periods at which acceleration in the building will be amplified beyond maximum ground acceleration, though relative displacements may not exceed peak ground displacements. Base isolation is the ideal method to cater this, by reducing the transfer of motion, the displacement of building is controlled. Displacement occurs at CG of the structures for fixed base structures, which will be approx. two-third height for buildings and at isolation plane for base isolated structures with lesser displacement within the structure. The response of a base isolated structure and a structure without base isolation can be illustrated as shown in the figure below. The displacement and acceleration is controlled by base isolation. Resistance to Vertical or other service loads. Well, what kind of mechanism can achieve this, resisting the gravitational pull of earth? A lubricated sliding surface? Or a strong magnetic levitation? These might sound right but are not the right engineering solution. It should be a system which is capable of restraining the structure under strong gust of winds and gravitational pull. 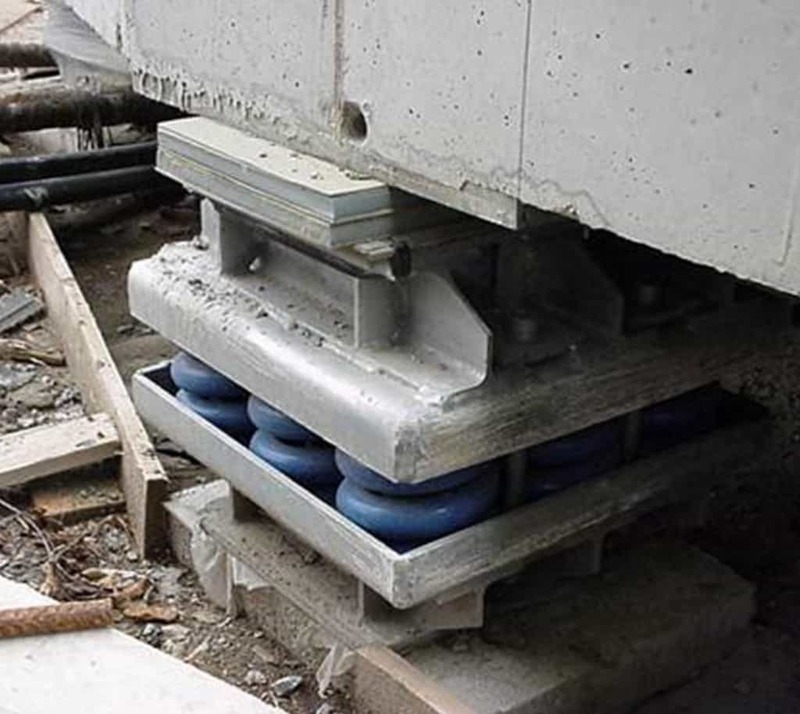 Though an ideal solution is yet to be discovered or invented, there are a few practical isolation mechanisms which are widely used in the field of earthquake engineering. Which means that these systems are capable of reducing the seismic demand of the structure. Bearings formed of horizontal layers of synthetic or natural rubber in thin layers bound between steel plates. These bearings are capable of supporting high vertical loads with very small deformations. These bearings are flexible under lateral loads. Steel plates prevent the rubber layers from bulging. Lead cores are provided to increase damping capacity as plain elastomeric bearings does not provide significant damping. They are usually soft in horizontal direction and hard in vertical direction. For isolation applications in machinery isolation, roller and ball bearing are used. It includes cylindrical rollers and balls. It is sufficient to resist service movements and damping depending on the material used. Steel springs are most likely used in mechanical applications as in roller bearings. It is not adopted in structural applications because it is flexible in both vertical and horizontal directions. This will increase service deflections. Sliding systems with a predefined coefficient of friction can provide isolation by limiting acceleration and forces that are transferred. Sliders are capable of providing resistance under service conditions, flexibility and force-displacements by sliding movement. Shaped or spherical sliders are often preferred over flat sliding systems because of their restoring effect. Flat sliders provide no restoring force and there are possibilities of displacement with aftershocks. Soft-story and Sleeved Piles and Rocking Isolation systems are other major systems. 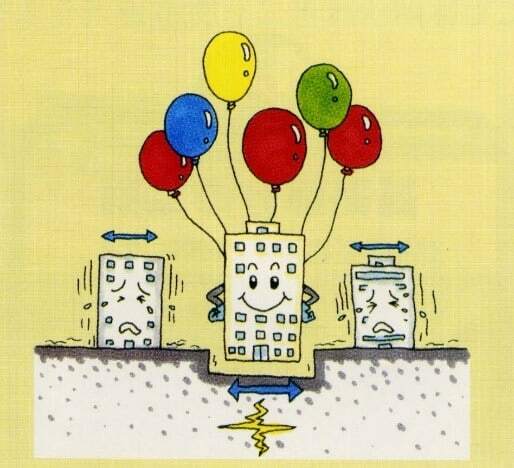 There are Six major types of base isolation devices which are widely adopted for seismic base isolation. Flexibility and Damping are the two major components of base isolation system. Flexibility of the isolation has predominant effect in response modification. Viscous dampers or Hysteretic dampers are often provided to enhance isolation. Response reduction using dampers is independent of the structure stiffness. 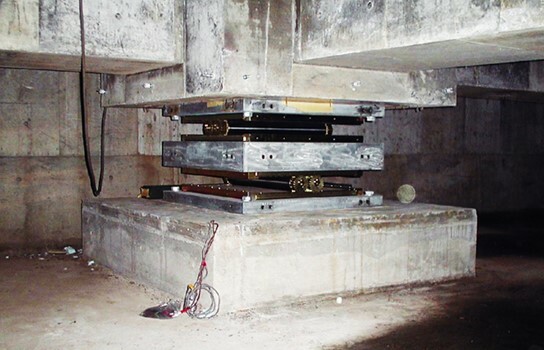 Types of Base Isolation System Dampers? Reduced the seismic demand of structure, thereby reducing the cost of structure. 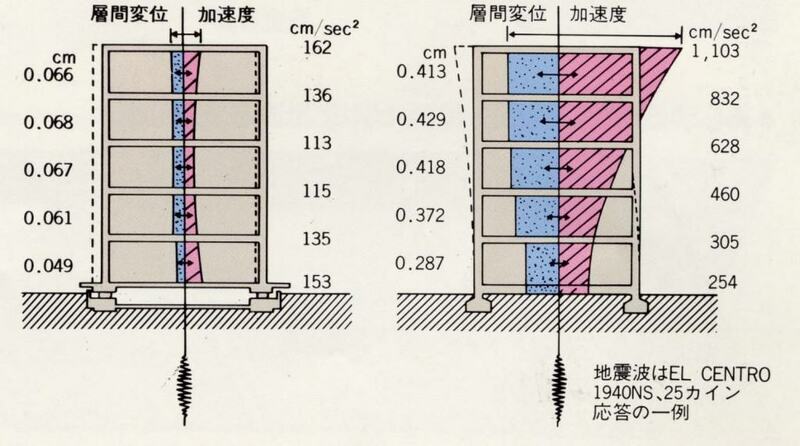 Lesser displacements during an earthquake. Reduced the damages caused during an earthquake. This helps in maintaining the performance of structure after event. Enhances the performance of structure under seismic loads. 1.0.1 What is Base isolation? 1.0.6 Types of Base Isolation System Dampers? 1.0.7 Advantages of Base isolation? 1.0.8 Applications of Base isolation?